We recently sat down with Jamal Nichols, a former product designer at Google and Equinox who founded Truth About Design last year, to discuss his favorite design tools, why he became a Springboard mentor, and his advice for aspiring UX designers. The full video Q&A is below, but here are some of the highlights. How did you become a UX designer? I kind of got lucky, I think, because at the time there were no UX design degrees, so I studied media systems design when I was in Germany, which was sort of like an interdisciplinary mix of design, computer science, and economics—it’s the perfect thing to study for people that can’t really decide what they want to do with their lives. But I very quickly figured out that I was good at the design part, and then I just started growing that. As I discovered that the user experience field was growing and that type of design was growing and that I had a knack for it, I just stuck with it. You’ve worked in a number of industries, from auto to finance to tech. How does UX design differ in terms of approach based on industry or type of product? The process of designing things—you know, doing research, understanding who you’re designing for, prototyping, and coming up with a high-end product—is very similar across industries. That’s why I was able to work in so many different industries. How the industries think about design is the difference, not how the designers practice design. So, for example, when you’re in banking, obviously people tend to be more conservative, they don’t want to take as many risks. That can be tough for designers because you can’t really unleash your creative ideas the way you want to in the banking industry. On the other hand, when I was in the gaming industry, you could just go wild and do whatever you wanted because you were working with people in their late teens and early twenties who understood technology. And then sort of a middle ground was when I was in retail working at Walmart because they just cover such a broad spectrum of people and various different segments, so there it was an interesting mix where you got to push the boundaries sometimes. In general, the way you practice design is going to be the same across industries and that’s why it’s relatively easy to make the switch across the industries too. A lot of times when I ask students where they would like to work, they say, “Oh, I want to work at Facebook, I want to work at Apple.” But they never think about: OK, what do you even have to offer? Why would they hire you? Because they’ve never been in a position where they had to hire someone else. Think about it: If you’re hiring someone else, you want to find someone that fits the team, that you enjoy being around, that can do the job. Oftentimes, when you’re just starting out, you just have so much more to learn, right? So, in order to get into one of those big tech companies, my recommendation is to consistently do your best work for a long time and keep learning and keep growing in your craft and continue to build the craft. You know, for the first three years after college, I spent almost all of my free time just reading everything I could, every blog post on every site, every book that was out there—I read them all and only after doing that for another three years after college, then I started getting the feeling that I’m kind of decent at this. And that’s when the bigger companies started taking notice. When it comes to the UX field, there’s a lot of tools out there, but the ones that I highly recommend you focus on above all else… are Sketch because it’s the industry standard—so that’s what you’ll use for low-fidelity wireframes and for high-fidelity visual work. Use Sketch, just use Sketch. Don’t worry about anything else—just use Sketch. If you want to add animations into your work—you know, once you’ve got the high-fidelity mockups done and you want to do animations and micro-interactions, use Principle. That’s the tool that everyone’s using and it integrates perfectly with Sketch. Building off of advice, what made you want to become a mentor? I knew that I wasn’t quite management material yet and didn’t really want to go on the management track, but I knew that I cared about people, I cared about teaching, I cared about mentoring—I had done a couple of volunteer mentoring engagements in the years before and just loved it. And, you know, when a student is ready, the teacher appears, so then General Assembly called me and said: hey, do you want to teach here? And I was like: absolutely. That got me on the track of teaching. And after that, you’re always teaching the same thing at GA, so after a while I decided I wanted to challenge myself in different ways, but also still mentor, still stay involved in the mentoring community, and that’s how I found Springboard. And it was just the perfect fit from the start. The broader question [is] what does it take to be successful as a designer, because that’s what most of the students are trying to accomplish. I think what’s really important there is that you have that tenacity that we talked about earlier, that you don’t give up, that you’re willing to work hard on your own and not just—you know, I’m a mentor, I’m not your personal trainer, right? A personal trainer will tell you exactly what to do all the time, while a mentor takes someone who is already driven and already kind of knows what they want and sort of just gives them a few pointers to accelerate their trajectory. The person is already going and the mentor is just like: OK, just adjust yourself a little bit and you’ll go even better and even faster. The Truth About Design: would you mind telling us a little bit more about that? How did you get started? That came about organically through my teaching experience and also speaking in front of students. I’ve just noticed that, you know, every year something like 5,000 to 10,000 new designers are coming out of these bootcamps and out of these colleges and a lot of times they’re just woefully unprepared for the real world. 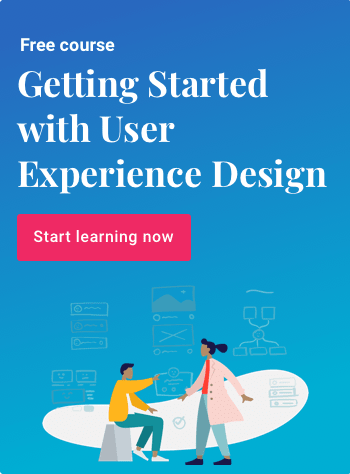 So, when I go out and speak to designers—like, for example, I have this course called “Is UX Right for You?” where I speak candidly about the downsides of UX. I’ve given that lecture in person and every time I talk to people about that, students come up to me like: thank you, Jamal, for telling me the truth and not just about how awesome UX is, because you know it can’t just be perfect. So, I decided to create a platform around that, around giving candid truth and guidance for the design industry and just sort of taking this message that I have and putting it out there to a larger audience. Looking for a UX design course that includes one-on-one mentorship with an industry expert like Jamal? Check out our UX Career Track now!